Since 1982 VideoMemory, a Supersounds Entertainment Company, has captured over 2000 weddings. Let our experienced team of videographers build your story to view and cherish for years to come. Put your trust in Supersounds Entertainment, the leader in DJ entertainment in New England for over four decades. The only company to offer DJ demo videos of all our DJs so you can see and hear your DJ before you hire them. Call to schedule your in-person appointment or phone consultation now. Green Mtn. Photobooth, a Supersounds Entertainment Company, brought photobooths to VT. In 2010. With 3 different kinds of booths and 8 booths total we won’t let you down on that once in a lifetime day! Ask about our package deal when booking more than one service. Danielle Allendorf recently joined the Supersounds family in 2016. Professionally trained at the Hallmark School of Photography she has shot over 60 weddings in her youthful career. Need additional services? We offer the most advanced up lights on the market from Chauvet, the leader in up light technology. We also offer audio visual rentals, LCD projectors, inflatable blow-up games, bounce houses, inflatable movie screens, laser light shows, blacklight volleyball, and more! VT DJ Services | Weddings, Staff Events, & More! Our Vermont Wedding DJ’s average ages are 36-46 and most have been with our company 12-20 years. This equates to hundreds of weddings that they have played for in their DJ careers. We are the only company that has a DVD of each DJ so you know who you can choose from! We also offer personalized consultations with the DJ that will be performing at your event so nothing is left to chance. Let our experience make your special day one to remember for years to come. Supersounds is THE VT DJ and Entertainment company for weddings, corporate events, bat/bar mitzvahs, school functions, and private parties! When you hire Supersounds you receive personalized planning sessions with Grant Allendorf, the area’s most experienced wedding music professional in the business. Our music database contains over 45,000 songs, covering every genre and the most popular hits of yesterday and today! Compile your favorites for a custom playlist. I initially wanted to have a band play for my wedding, however it didn't fit with the budget we had set. We chose to go with Supersounds DJ and I would not do it any other way now! Grant Allendorf, the owner, was great. He responded promptly to all of my questions. Bucky Brandt was our DJ and did a great job. We had an outdoor ceremony at the reception site and he was there early to set up and make sure the sound for the ceremony was perfect. We had no sound issues, and everyone could hear us clearly. He had ideas to keep the kids busy at the end of dinner. He played a great mix of music for our guests ( ages 4-80)- and they were all dancing! My guests kept telling me how much fun they had at the wedding, and I have to thank Bucky for making that happen! Mike Toomey was our DJ aboard the Spirit of Ethan Allen, and he did a fantastic job! During the week leading up to the wedding, Mike reached out to us to confirm all the details and songs we wanted during our ceremony and reception. He is so professional and definitely knows what he's doing. Our guests enjoyed themselves and left the wedding saying how fun it was. That was our goal, and I know Mike and Supersounds Entertainment were a big part of making the day what it was. I highly recommend their services. My husband and I had a great experience working with Supersounds Entertainment and our DJ Mike Toomey was great! We had a large wedding with a many age groups and he was able to get everyone on the dance floor! We would highly recommend Supersounds Entertainment for any wedding occasion! Supersounds was wonderful from the very beginning. We had timely and informative conversations with Grant, and he set us up with an amazing DJ, Mike Toomey. 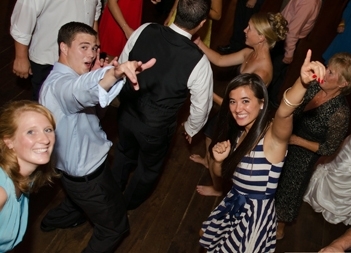 Mike got the entire crowd on the dance floor at the Catamount Golf Club, and kept the party going from start to finish. He was very interested in incorporating our specific needs during the reception and made sure we were comfortable with his timing throughout. If you use Supersounds, you will be able to sit back, relax and enjoy your wedding day! We were beyond thrilled with DJ Bucky Brandt from Supersounds Entertainment! He far exceeded our expectations for our wedding reception. He was super friendly, responded to emails and changes the day of in a timely manner, made literally LAST second accommodations, and was excellent at involving not only our adult guests but entertaining the children as well! I would recommend this company to any Bride to be that asked, and will definitely use them in the future for events! We thoroughly enjoyed working with Supersounds for our wedding. Grant was very responsive to our messages and was so easy to do business with. He set us up with Bucky who is a great DJ, who we highly recommend him. He did a great job keeping everything on track with our timeline, and played all our requested songs (and prevented the ones we didn’t want from being played!). Everyone had a great time at the reception and we danced all night long! If you book Supersounds for your wedding day, you will be able to just enjoy your day, as they will take care of everything. My husband and I recently were married in Greensboro, VT and found SuperSound Entertainment through recommendations online (vtvows.com) -we contacted the owner Grant Allendorf and were immediately convinced that they were the ones to DJ our wedding and staff our photo booth- based on his speedy response and attention to detail. Duane Dakin (our DJ) was great- he had wonderful recommendations to get everyone (ages 4-70) on the dance floor TOGETHER-- and not all DJs can do that- he really knows what he's doing and gauges the audience really well. He also played tons of our music but also played tons of guest requests (which was really important to us)! Logan Vanasse ( photo booth host) was fantastic too- we had tons of kids who spent the vast majority of their night going in and out of the booth (which was great!) but he also made sure that the other guests got their time in there too- which made for a hilarious photo book. I would absolutely recommend SuperSounds! Want your celebration to be incredible? Then get started by contacting us today!